Situated in Andover in the county of Hampshire, UK, the parish is in the Catholic Diocese of Portsmouth. With other parishes in Basingstoke, Tadley and Hook, it forms the North West Hampshire Pastoral Area. 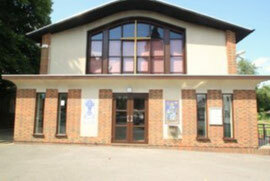 Holy Mass is celebrated here every Saturday evening at 6.00pm (Sunday Vigil Mass), and on Sundays at 10.30am. Times of weekday Masses and all other services are available on the Parish Newsletter. Holy Mass is also celebrated at the Church of Saint John Fisher in Whitchurch to the east of Andover on Sundays at 9.00am. Mass in the Syro-Malabar Rite is celebrated on the first Sunday of the month at 4.00pm. If you haven't registered with the Parish Office, then please find below a Parishioner Registration Form in the 'new' format. Completed forms need to be sent to the Parish Office.